Nine day festival of ‘Navarathri’ (நவராத்திரி) or ‘Dussera’ (தசரா) has just begun. As festivals are often associated delicious food, navarathri is almost synonymous with ‘sundal’ (சுண்டல்). Nonetheless, there are other snacks that are prepared during navarathri. One such snack is called ‘kunukku’ (குணுக்கு), and my paternal grandmother used to make it during dussera. Kunukku is different from vadai, as it has rice as an ingredient, which makes it firm and crispy. This is a traditional recipe, which makes an ideal snack to be distributed along with ‘thamboolam’ (தாம்பூலம்) during navarathri festival. Check out the recipe and try it out this dussera season! Method: Wash and soak Bengal gram dhal, black gram dhal and boiled rice in sufficient water for 4-5 hours. Later wash once again and drain fully. Grind the soaked ingredients with salt, red chilies and asafoetida, sprinkling water as required into a thick paste using the mixer-grinder. Add grated coconut and curry leaves (Fig.1). Mix well and keep aside. Heat oil in a medium sized kadai; to check if the oil is ready, drop a small quantity of the batter into the oil and if it rises to the surface, you may start frying kunukku. Drop small balls (approximately 2 teaspoonful) of kunukku batter in the oil and fry on medium flame. Keep turning the balls with a sieve spoon (ஜல்லிக் கரண்டி) every now and then till they become golden brown in color (Fig.2). Remove from the oil and place them on a tissue paper for the excess oil to drain. You may fry 8-10 balls at a time. Repeat this process till the batter is used up fully. Your yummy snack is now ready! You can simply eat kunukku without any accompaniment. 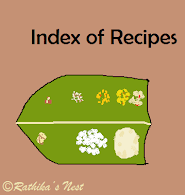 Check out other 'Navarathri recipes' on Rathika's Nest by clicking on the image on the right hand panel!